All olives are initially green and turn black as they ripen, all of the almost 2000 different cultivars. Green olives yield high quality oil but a low quantity of between 5 and 10%. Fully matured black fruit yield a high quantity of between 15 and 30% but the oil is of a inferior quality. The best quality oil comes from healthy fruit that is half ripe. These fruit unfortunately have a lot lower oil content but is of a superior quality. One can compare it to a banana – all bananas are green when unripe, then they turn colour, yellow, when they are ripe and all of them becomes black when overripe. Olives follow that exact same route. When you want to process green Olives – you would harvest certain cultivars when they are not green anymore, but have a light yellow colour – second image below. 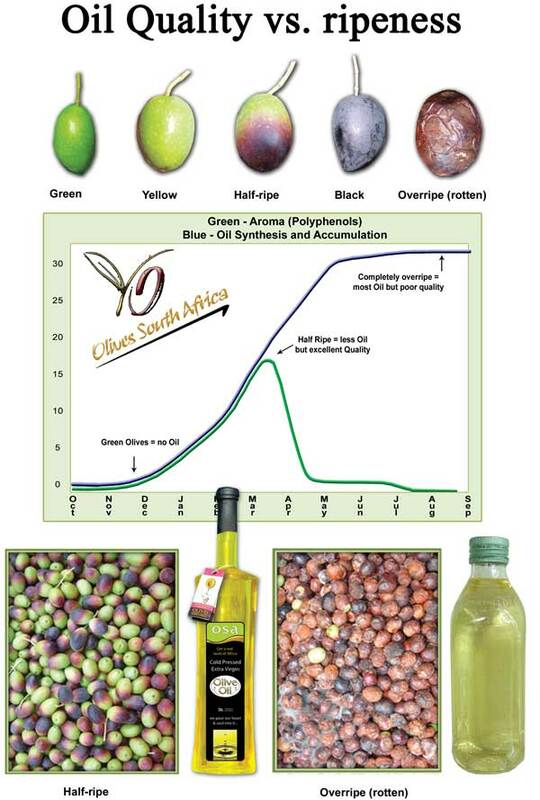 The best Oil comes from Olives that are turning colour, half ripe. When you want to process Olives for black Table olives you would harvest the fruit when completely black. 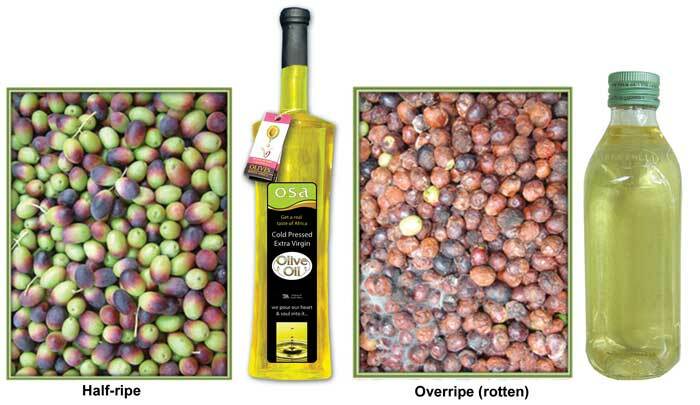 Even though overripe fruit yield the highest quantity Oil it is of a inferior quality. Be sure to go to our DVD that Illustrates this and the whole process in dept.